I spend a lot of time in waiting rooms or in meetings and that as well as production and administrative chores seriously cuts down on the time I have for drawing for my own account. The trouble is that if I don’t do at least some drawing I become a bit annoying. That’s because I think that drawing and unfettered fine art is my “real job;” everything else is my day job. The day job is what you do to make money or to maintain your world; necessary but not sufficient. I solve the problem by carrying around a sketch book or two so I can use the time I spend waiting around to do something worthwhile. I recommend it highly. 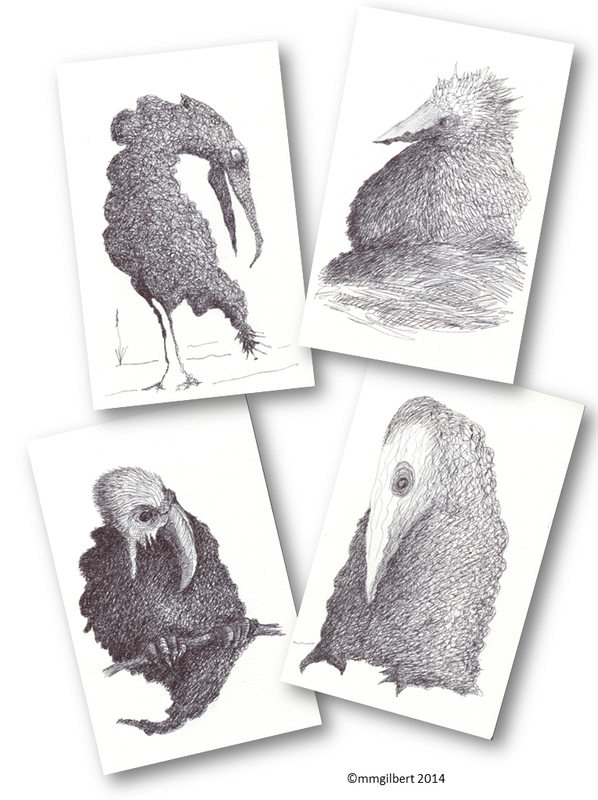 Lately I have been drawing “weird birds” in a 5 x 8 inch Moleskine watercolor pad using a fine-point ball point pen. Over the past few years, ball point has become an accepted medium for drawing. It is light-fast and stable as well as very convenient. You cannot beat its portability. Take it anywhere, even on aircraft. It is important to wipe the tip as you work as the ink may build up and smear. Otherwise, it works well. I’ve been drawing “weird birds” because I am comfortable doing them and when you are drawing “on the fly,” whenever you have a spare minute or two, it is better to keep things simple. You don’t want to worry about accuracy of depiction or about making mistakes. I try to keep the work loose and to focus on form and light. The four birds above are cases in point. I start really simple and add as I can. In a couple of weeks, I will fill my current sketchbook and will need to start another. It would be nice if there were a market for these little drawings but it doesn’t matter; their main job is to keep me sane. This entry was posted in Uncategorized and tagged ballpoint pen, bird, figurative, ink, sketch, small work, watercolor. Bookmark the permalink.